Where the sun shines all night! 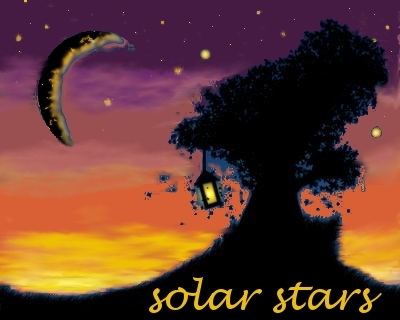 Solar Stars are beautiful outdoor lights that are powered by the sun and are constructed from repurposed items! What more could you ask for in an environmentally conscious product? Solar Stars make perfect gifts that are used and appreciated night after night-they're beautiful on your patio table for dining al fresco, enjoying your favorite flowerbed after the sun sets, or brightening the path to your front door. They would be stunning in a twilight wedding reception as centerpieces for the tables! The best news is these lights don't seem to attract those pesky insects that are attracted to incandescent lights! Custom orders are welcome, and requests may be made for a style (modern, country, etc.) or type. However, please keep in mind that each Solar Star is unique, and will vary depending on available materials. Purchases are not expected on a custom piece until after your Solar Star meets your approval!